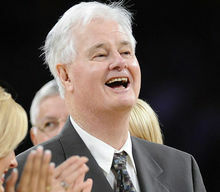 Assistant Coach Fred "Tex" Winter was the mastermind behind the triangle offense which helped lead Phil Jackson's Chicago Bulls and Los Angeles Lakers to nine NBA championships. The Bulls won titles from 1991 until 1993 and from 1996 until 1998 and the Lakers from 2000 through 2002. For full obituary and coverage from Legacy.com, click here.